People once thought that dogs aged seven years for every human year, but their actual ages depend on their breeds and other factors. Some dogs age slower than humans do while others age more rapidly. Once your dog reaches an advanced age, you need to make some changes to its routine and use other tips to care for that pup properly. Making appointments to talk to your vet is one of the best things that you can do. You should make an appointment every year at the same time. Your vet will look over the dog for any symptoms that can indicate serious medical conditions, including cancer and diabetes. The vet will also determine if your dog needs any medications to care for those conditions or if it needs a change in its routine. As your dog ages, you’ll often find that you need to give it supplements or a new type of food. You can buy dog vitamins online and order supplements from those same sites. If you ever spent time around an elderly person before, you probably noticed that he or she moved a little slower. Your elderly dog will slow down too. Dogs of an advanced age will often suffer from joint problems that cause them pain and discomfort when they move. You can reduce the strain that physical activities have on your dog in a few different ways. It might be helpful to set the dog up with a place to eat and sleep downstairs to keep it from climbing the stairs. You can also purchase small steps that help the dog get on the couch or into bed without jumping. Smart pet owners keep a watchful eye out for any symptoms that might indicate a serious medical condition, especially as their pets age. You’ll want to look at whether the dog whimpers or makes other types of noises when walking or playing, which can relate to a muscle, bone or joint condition. Older dogs can also suffer from diarrhea or constipation caused by an intolerance to their food. You may need to make changes to your dog’s diet. Vets recommend that pet owners avoid giving their older dogs table scraps too. Your vet might recommend a multivitamin that provides all the nutrients and vitamins that your dog needs to get through the day. Other supplements can help your dog too. 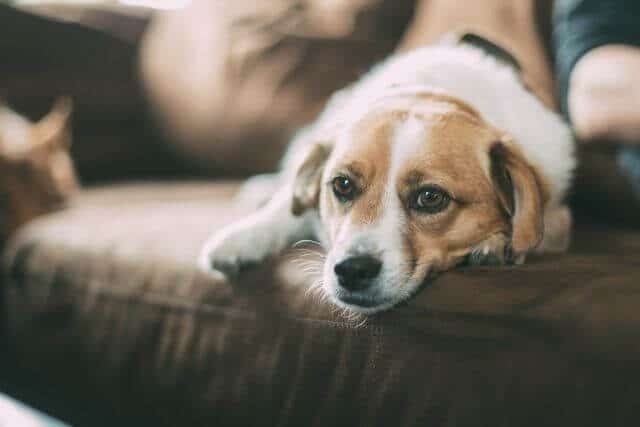 There are products designed to help an older dog cope with any pain it feels as the result of conditions such as arthritis and supplements that can reduce inflammation and help your dog sleep through the night. Before you buy dog vitamins online, it’s important that you speak to your vet. The vet may want a list of ingredients found in the vitamin or the name of the company who made it. Until you get approval from your vet, you may want to hold off on giving your dog any over the counter vitamins or supplements. Though you might feel tempted to put one large bowl of water out for your older dog and let it drink from that same water for days, you really need to give your dog access to fresh and clean drinking water. A pet fountain is a great choice for most homes. These fountains have small motors that keep the water circulating. They also do a good job of keeping that water cold. You can fill the fountain once and provide your dog with a source of clean drinking water that will last for days. An older dog can fill your house with love and make you feel great about coming home each day. You just need to know how to care for that older dog and how you can make its life more comfortable.